@ActiveProfiles is a class-level annotation that is used to activate profiles while loading ApplicationContext in Spring integration test. @ActiveProfiles has following elements. profiles: Specify profiles to activate. resolver: Specify ActiveProfilesResolver to activate profiles programmatically. value: It is alias for profiles element. inheritProfiles: Boolean value to decide whether active profiles should be inherited from superclass or not. The default value is true. 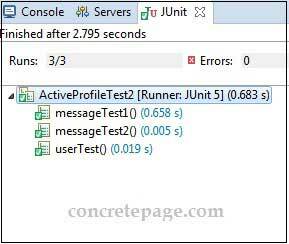 @ActiveProfiles are used in Spring integration test as following. To Activate multiple profiles using @ActiveProfiles, specify profiles as an array. Here on this page we will create Spring integration test classes using @ActiveProfiles annotation with complete example. Here we will create an application in which we have two JavaConfig with profile name dev and prod and we have two animal components with profile name lion and elephant. Find the test class with @ActiveProfiles annotation that activates prod and lion profiles. Find the main files of the application. @ActiveProfiles has inheritProfiles element which accepts Boolean value that decides whether active profiles should be inherited from superclass or not. The default value is true. Here in our example we have two test classes out of which one extends another. The super class has activated only lion and child class has activated prod profile. In the child class lion profile will also be inherited because the default value of inheritProfiles is true. Find the print screen of the output. Here we will use @ActiveProfiles annotation with @SpringBootTest annotation in Spring Boot integration test. The @SpringBootTest annotation is used at class-level to create a test class in Spring Boot application. Now find the main files of the application.